Love how you made a couple of blocks with the dark background.... that's a great design idea that I hope I remember. Congrats on another terrific quilt! Beauty of a quilt. I'm sure your brother and SIL will be thrilled with it! I'm working on getting some sewing done by this weekend and then I can worry about decorating. I don't do much. Put up a tree and some wall hangings. Call it done. But it works for me. Your brother and sister-in-law are very lucky to have you make them a beautiful quilt! I've been making Christmas stockings for the grandkids and an I Spy quilt for one as well. 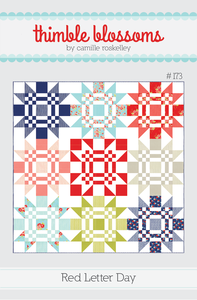 I'm chomping at the bit to make a Christmas quilt. Anne D.
Great quilt! Your brother is really lucky to have a sister like you make him something so gorgous. beautiful quilt, I do hope to make this quilt next year. Great variety of fabrics, I bet he will be thrilled with the quilt, a wonderful gift. JUST GORGEOUS Thelma ! Your brother and his wife will be thrilled ! What a fabulous quilt. Great fabric choices. This quilt is so gorgeous! Love the fabrics and the larger size. Congrats! It looks wonderful Thelma. I need to bind my first Red Letter Day (started in a class with Camille when she came to Aus in June) and am planning one in oranges with white background to start early next year for my sister-in-law. It's a fabulous pattern. The quilt is really gorgeous! I love this quilt. Beautiful selection of colors and prints. Your brother should be thrilled! This is wonderful Thelma! The big blocks don't look so big, maybe because they are composed of so many small pieces. You did a fantastic job with it!